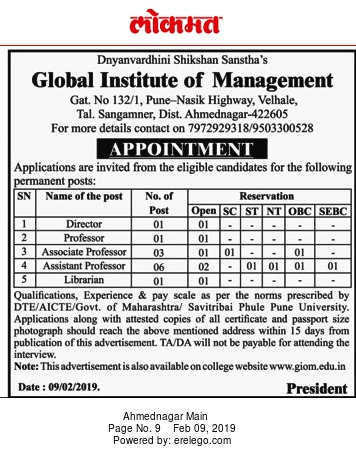 Global Institute of Management, Ahmednagar has advertised in LOKMAT newspaper for the recruitment of Professor / Associate Professor / Assistant Professor / Director / Librarian jobs vacancies. Interested and eligible job aspirants are requested to apply within 15 days from 09thFebruary 2019. Check out further more details below. About College : lobal Institute of Management is one of the premier Institute of Management Approved by AICTE New Delhi ,DTE Mumbai and affiliated to Savitribai Phule Pune University has played a unique role in the advancement of Management Education. The Global Institute of Management is established in 2010, as a unique campus at Velhale, Tal-Sangamner, Dist-Ahmednagar (Maharshtra). Qualifications: As per DTE / AICTE / Govt of Maharashtra / SPPU norms. Salary: As per DTE / AICTE / Govt of Maharashtra / SPPU norms. How to Apply: Interested and eligible candidates are requested to send application with attested copies of all certificates / testimonials and recent PP size photograph to the below postal address.